We’re excited to announce the soloists for our next concert, Handel’s Israel in Egypt on 1 April 2017. Emma Walshe, Rachel Ambrose Evans, Jeanette Ager, Roland Wood, Nigel Cliffe will be accompanied by The Coro Baroque Consort. Soprano Emma Walshe has performed all over the world with The Tallis Scholars , and has been a permanent member of the group since 2014. In June 2013, Emma Walshe sang the role of Daniel in George Frideric Handel’s Susanna with the Early Opera Company at the Spitalfields Music Summer Festival. 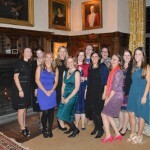 Soprano Rachel Ambrose Evans’s recent solo engagements have included George Frideric Handel’s Israel in Egypt (Holst Singers/Stephen Layton), J.S. 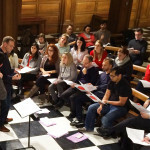 Bach’s St Matthew Passion and St John Passion (Israel Camerata Orchestra Jerusalem/Avner Biron), Monteverdi’s Vespers of 1610, and Antonio Vivaldi’s Gloria with the King’s College Choir Cambridge and St John’s College Choir in Cambridge. In 2017 Rachel travelled to Scandinavia for the first time to perform a staged version of G.F Handel’s Messiah at the Bergen Opera with Amici Voices. Alto Jeanette Ager’s solo work has included: recitals and other appearances at the Wigmore Hall; Handel’s Messiah at St David’s Hall, Cardiff; Elgar’s Dream of Gerontius at the Queen Elizabeth Hall; Tippett’s Child of our Time at the Royal Festival Hall; Verdi’s Requiem at Gloucester Cathedral; Beethoven’s 9th Symphony at the Barbican Concert Hall and the Missa Solemnis at York Minster, Truro and Exeter Cathedral. In addition to performances at many of the leading venues in the United Kingdom, Jeanette’s concert work has taken her to Bermuda, the Czech Republic, Spain, Libya and China. Baritone Roland Wood made his Royal Opera debut in 2015 as Roucher (Andrea Chénier) and has since sung Ford (Falstaff) for the Company. 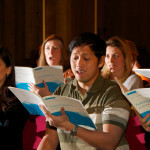 He regularly sings with English National Opera, where his roles have included Kissinger (Nixon in China), Marcello (La bohème), Alfio (Cavalleria rusticana), Zurga (The Pearl Fishers), Paolo Albiani (Simon Boccanegra), Count Almaviva (The Marriage of Figaro), Speaker and Papageno (The Magic Flute), Bunyan/Pilgrim (The Pilgrim’s Progress), Don Fernando (Fidelio) and Oedipus (Thebans). 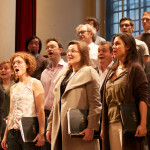 Baritone Nigel Cliffe is a member of the Royal Opera Chorus, which he joined in 1999. He has sung many solo roles for The Royal Opera, in operas including Der Rosenkavalier, Rigoletto, L’anima del filosofo, Die Meistersinger von Nürnberg, Sophie’s Choice, Pagliacci, Thaïs, La Gioconda, Dom Sébastien, roi de Portugal, Cyrano de Bergerac, Macbeth and Die Zauberflöte. 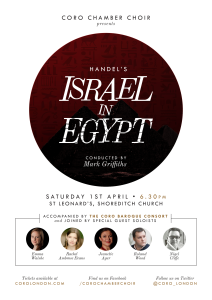 Coro performs Handel’s dramatic oratorio, Israel in Egypt, on 1 April 2017 at St Leonard’s Shoreditch. Buy Tickets here.